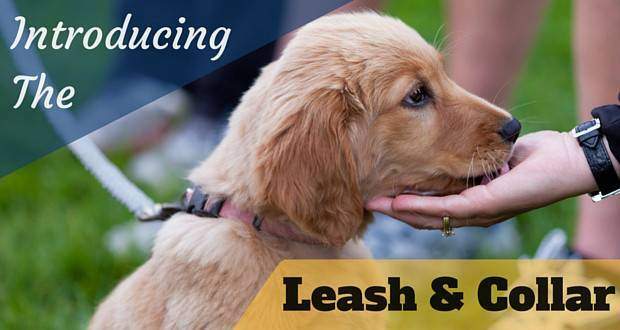 Among the first things you should be teaching your new puppy is to get comfortable with wearing a leash and collar. You’re going to be walking your dog for the rest of their life and while on a walk, a leash is the only means you have to keep them under control and more importantly – out of danger and trouble! So it’s important they get used to their collar and leash sooner, rather than later. Unfortunately, many puppies rebel against it, try to scratch off their collar, chew on their leash and do anything they can to free themselves. Luckily, almost all puppies will very quickly become accustomed to and accept their collar and leash. But if you’re yet to introduce the idea and want to make the process as quick and painless as possible, or have a puppy who just won’t accept wearing them, this is the article for you. 1 When Should You Start? 5.1 What If My Dog Is Too Excited By The Leash? Your new pup won’t be able to go out for walks until they’re at least 12 weeks old, after having had all the correct vaccinations. So if you bring your pup home at 8 weeks old, it’s not necessary to start right away. A good rule of thumb is to begin leash and collar training when your puppy is around 10 weeks old. This gives them a couple of weeks to settle in before you get started. There’s generally a lot for your pup to get used to in their new house, so taking it slowly is advisable. At this point, you’ve still got another couple of weeks before your four-legged friend can go out on their first walk, which should be plenty of time to get them accustomed to their collar and leash. It might not seem like such a big deal, but choosing the right collar and leash for your pup is imperative. They should be as un-intimidating so as not to freak your young dog out. You might be tempted to simply pick out the cutest leash and collar in the store, but choose the wrong ones and it could mean your training doesn’t go as smoothly as you’d hoped. Choose a lightweight collar. Anything too heavy may feel uncomfortable to your puppy. At this stage, webbing is the best choice. Pick out a regular flat collar. We would never recommend using a choke chain or any kind of correctional collar. Select a collar with snaps or clips, rather than buckles. This kind of collar will be quick and easy to get on and off your puppy. Get a well-fitting collar, not one that they’ll grow in to. Measure around your puppy’s neck, allowing you to insert two fingers between the collar and your puppy’s neck to find the correct size. Find a soft, lightweight leash. Again, webbing is a good choice. 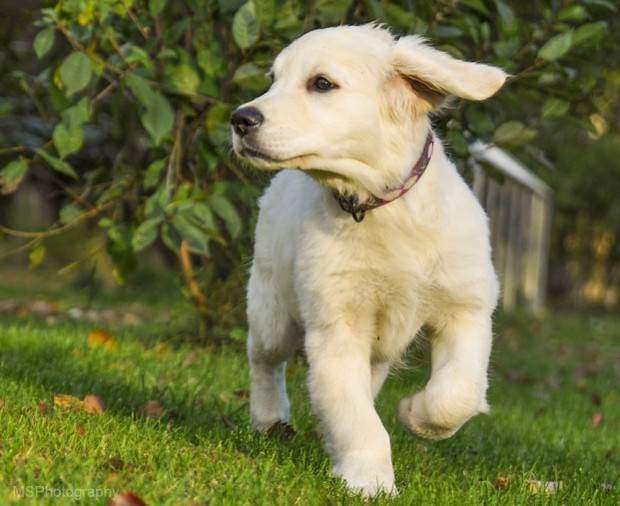 Resign yourself to the fact you’re going to have to buy another leash when your puppy gets older, so don’t worry if the leash wouldn’t be strong enough for an adult retriever. 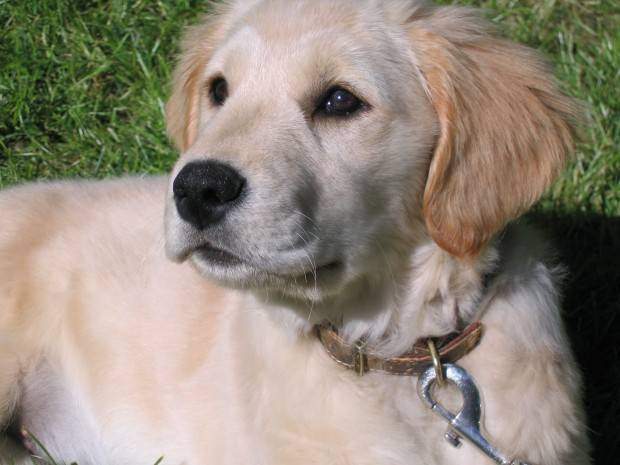 Related Article: 10 of the Best Collars for Golden Retrievers. You can’t expect to put a collar and leash on your pup and just start walking them around. Like all dog training, it’s a gradual process you should take slowly. The first step is to get your puppy used to wearing a collar. Once they’re comfortable with this, you can move on to the leash, but let’s not get ahead of ourselves! Before putting a collar on your pup for the first time, you should make sure they’re in a calm mood (or, as calm as possible for a 10-week-old puppy) and are in a safe place without too many distractions. You should also be in a calm and positive mood, as your attitude is just as important as your pup’s when it comes to training. The idea is to very gradually get your little one used to their new collar, so you’ll start by just putting it on your puppy for 5 or 10 minutes, and then increase this amount of time. It’s vital you make sure your pup’s collar fits right. It should be loose enough to fit two fingers in between the collar and your puppy’s neck. Any tighter and it could be uncomfortable, any looser and they’ll be able to slip it off. If your puppy’s calm enough, check the fit the first time you put it on, otherwise check the fit as soon as possible after that. Now, all you need to get started is your puppy’s collar and a sack load of tasty treats. At a time when you and your puppy are both relaxed, simply fasten the collar around their neck. Don’t make a big deal out of it, or your dog will think there’s something up. You want them to feel like it’s nothing to be concerned about. This is when you’ll likely discover whether getting your canine companion used to their collar is going to be easy or hard. Some puppies are completely unfazed by their collar, whereas others want to get this malicious intruder off their neck right away. If your puppy is calm, great! Give them lots of treats, fuss and praise, so they associate their collar with all the good things. If your puppy is trying to scratch or shake their collar off their neck, or is generally displeased, hang in there. Your first instinct might be to take the collar off, as it’s causing your puppy distress, but you’re just going to have to sweat it out. If you take the collar off while they’re doing this, it will reinforce the behavior. So, next time you put it on them they’ll remember all they have to do to get you to take it off is scratch at it, or whine, or bark, or whatever undesirable behavior they were exhibiting. Once your puppy is calm, even if it’s just for a second, say “yes” or “good dog” (or if you’re clicking training, mark the behavior with a click) and give them some treats and some fuss as a reward. The very first time you put the collar on, you probably only want to leave it on for about 5 minutes. Although, if they receive it very calmly, then you could go up to 10 minutes or so. Make sure your puppy is supervised at all times when wearing their collar the first few times as they won’t know what to do if they snag it on something and they could hurt themselves. Remember, never take the collar off when your puppy is freaking out. Always wait until they’re calm, or it will give them the wrong message. After the first time, getting your puppy used to their collar is simply a case of gradual acclimation. If you’re at home with your puppy all day, you could have four or five short collar training sessions every day, but you should aim for at least two. Gradually increase the amount of time your puppy wears their collar with each session, but remember to take it slowly, especially if your dog isn’t super keen on the experience. You want to make it seem like wearing a collar is part of their day-to-day life, so do things you’d usually do with your pup while they’re wearing their collar. Try doing a bit of command training, such as asking your puppy to sit while they’re wearing the collar. Feeding your pup a meal is also a great idea, as they’ll start to think collar = yummy food. A good old-fashioned play session wouldn’t go amiss, either. It’s all about creating positive associations so, in their head, their collar means good times are coming. Some puppies will be perfectly comfortable wearing their collar on the first day, whereas others might take a week or more to get used to it. Remember to keep it positive and let your canine chum learn at their own pace. When they’re wearing their collar with no issues, you can start on the leash. Depending on the temperament and personality of your puppy, getting them used to the leash may be easier or harder than getting them used to the collar. As ever, you need to be patient, persevere, and keep a positive attitude. If you do all this, it won’t be long until your pup is walking on the leash like a pro. It might seem like all this collar and leash training is a bit excessive, but it will help you out in the future, as it will make it much easier for you to teach your pup not to pull on the leash. After all this collar training, YOU might be ready to walk your pup around on the leash, but THEY aren’t yet. Once your puppy is comfortable in their collar, as discussed above, you can clip on their leash for the first time, but clip it on is all you do. Don’t hold on to the end, just let your dog drag it around behind them. This is why buying a lightweight leash is important! Make sure you supervise your dog at all times during this process, as you wouldn’t want them to get caught on anything and panic. Like when training with the collar, give treats and praise to your puppy to create a positive association with wearing their leash. You can also lure them with treats so that they walk around next to you while wearing their leash, without any pressure on it. This will set the stage for them walking next to you with a loose leash. Start out with them wearing their leash for about 10 minutes at a time, and gradually increase this. After a day or two of occasional short training sessions, your puppy should have grown accustomed to dragging the leash around on their own, so now it’s time to pick up the other end. The key here is you always want the leash to remain slack. If there’s pressure on the leash, your dog will instinctively pull against it. So, if you put pressure on their leash at this point, you’re setting the groundwork for your dog to pull on the leash as an adult. The way to avoid putting pressure on the leash at this stage is to simply follow your puppy around wherever they should go, following closely so as to keep the leash loose. Practice this for a few minutes at least four or five times a day for one or two days and you should be ready to move on to the next step. The next stage is for you to become the leader, telling your puppy where they should be walking, rather than the other way around. This can be tricky at first because, like before, you want to avoid putting any pressure on the leash, so can’t just start dragging your pup around and hope for the best. You’ll have to start by luring your dog to follow you, using a treat or toy. It’s a good idea to use a high-value reward at this stage, such as a treat they really like, but don’t get to have very often. When your puppy is following you around nicely, be sure to offer them lots of praise and encouragement so they know they’re doing good. Every now and then, you should also give them one of their treats, or stop for a quick play session. You should be practicing this in short bursts of 5 or 10 minutes multiple times each day, until your puppy is allowed to leave the home for their first proper walk. If you’ve taken the time to carefully get your puppy used to their collar and leash, then you should find this has paid off by the time they go out on their first walk. That said, you have to remember this is the first time your pup has been allowed to walk outside of the house or garden, so everything will be new and exciting, with lots of interesting smells to sniff and areas to explore. So, don’t be surprised if they’re not such a star on the leash out in the open as they are at home. It’s important to maintain the loose leash rule and be consistent with it, if you don’t want to raise a dog who pulls. If your dog is lagging behind, lure them on to follow you using some extra-delicious treats. Again, high-value treats are key here, to compete with all those lovely smells and other distractions. If your pup is pulling ahead, you’ll need to use a different tactic. Every time they pull, stop completely still and don’t start going again until they’ve relaxed and are no longer putting pressure on the leash. This way they’ll learn that when they pull they actually get where they want to go slower, rather than faster. This might mean things are very slow-going at first, and you may not even get particularly far from your own front door, but it will pay off in the end. As ever, be sure to treat and praise your pup when they’re walking nicely on the lead. Of course, it’s easy enough to explain how to get your pup used to their leash and collar, assuming the best-case scenario, but sometimes there are additional issues to deal with. Here, we’ll look at some common issues you might face and how to deal with them. What If My Dog Is Too Excited By The Leash? If your dog is overly excited by the leash, or gets anxious when you try to put it on them, you’ll need to gradually get them used to it, so they know it’s no big wow. Put the leash around the house in places that your dog can see it, but won’t be able to get at it. For instance, if your puppy is crate trained, then you could put it in front of their crate, on the other side of the bars. You could also put it next to them as they eat their dinner, so they can see it, but will be too distracted to try to play with it or destroy it. They should soon learn that the leash is an everyday part of life, and nothing to get too worked up about. If you want to pre-empt this issue, start putting the leash in places your pup can see it from the moment you bring them home. Some dogs like to think their leash is their own personal tug toy and will try to bite, tug on or play with the leash while you’re walking them. This is usually just due to excitement, but it can also be to gain some kind of attention, even if it’s negative. Here’s what not to do: Never shout at your pup for biting or tugging on the leash and certainly never tug back to get it out of their mouth, because then they’re getting what they wanted: a fun game of tug. Instead, you should stop completely still and release any tension from the leash when they bite it. Once they let go of it, praise them and keep on walking. If this doesn’t stop them, walk with two leashes attached to their collar. Hold one and let the other drag. As soon as they start biting the leash you’re walking them on, pick up the other one and drop the one they were tugging on. This way, they will never get the game that they want and will soon grow bored. Also, make sure you’re praising and treating your dog every so often when they’re walking nicely with a loose leash, so they don’t feel the need to act out for attention. If, after reading this, you’re thinking that it’s way too much effort to get your puppy used to their collar and leash in this manner, don’t be discouraged. It might seem long-winded, but really you only have to put in a little time and effort every day to be successful. Although it’s more time consuming than simply strapping on the collar and leash and hoping for the best, doing it this way could save you lots of time and energy in the long run. A puppy who is taught to get used to their collar and leash in this way should be much easier to train to heel or to walk with a loose leash. It might seem harmless when a puppy pulls on the leash, but think about the same behavior from an adult dog!